Slept in Phoenixville PA, returned to Philadelphia next day. Return train Sunday 4/30 2:45 PM from Philadelphia to Richmond, then drove to Carrboro, arrived home 10:15 PM. 30th Street Station is a grand welcome to the City of Brotherly Love. No matter how hard places like Raleigh/Durham try with their new airports, nothing compares to the feeling of emerging from a long train ride, then walking into a glorious train station in the center of the city. The tall ceilings evoke the cathedrals of Europe. 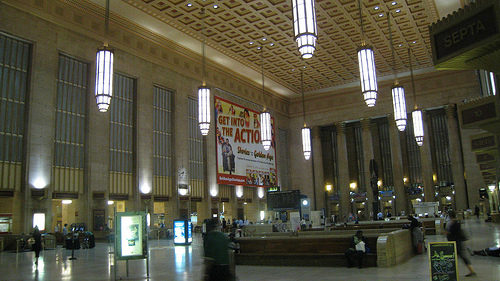 Unlike arriving by airplane, when arriving Philadelphia by Amtrak you know you are in the center of the action. The Schuylkill River bike path to Valley Forge and beyond, at least thirty miles long, starts right across from the train station. However, before starting the bike path, I took a spin through Center City Philadelphia. Center City was pleasantly lively. On this sunny Saturday, downtown shopping was brisk. Philadelphia’s City Hall is a glorious monument to the wealth and influence of the city in the late nineteenth century. It was briefly the tallest habitable building in the world. William Penn lords over his domain from the top. This bicycle journey is as much an exploration of the early suburbs as it is about the city. Americans have always strived to move out. Ask any American where they want to live, and most people include the word “out”. Where are you moving? We are looking “out” in blankety blank. The Philadelphia Main Line is an early expression of that desire. These suburbs spread along a railroad line westward from downtown. South Philadelphia — West of Broad Street areas known as Point Breeze and Grays Ferry. Also avoid the area around 5th Street; from Wharton down to Snyder. Parts of Northeast Philadelphia — Areas such as Frankford and Kensington are very dangerous areas. Avoid them also. Let’s get this right: because downtown is more or less on a north / south river, there is no East Philadelphia. If you do go east across the river, Camden NJ is among the most dangerous places in America. So don’t go North, South, or West. Or East. OK, right. Despite these ominous tones, the bike path west along the Schuylkill River threads this dangerous needle beautifully on a glorious late April afternoon. I cycled slightly north of the Main Line from Center City. This route goes through Fairmount Park, which is in many ways the Central Park of Philadelphia. Crew (rowing) teams were competing out of their century old boat houses along the river. I saw Ivy League schools like Penn and MIT as well as a few prep schools. The bike path goes on and on up the river. Further west the trail has a few gaps, and one rides through pleasant city streets. I was reminded of something I thought many years ago; that Philadelphia is the true start of the Yankee north, culturally. While Baltimore is exceedingly urban, it still has a slight vestige of Southern gentillity. In this strip of western Philly, I saw a shiny SUV with its windows open, driven by an Italian looking guy with a backwards baseball cap, Bruce Springsteen blaring out the window. Drivers were very aggressive. This feels culturally very far from North Carolina and Virginia. I overnighted in Phoenixville, a formerly industrial Victorian town, a few miles west of Valley Forge. Its downtown is pleasantly revitalized, with a strip of nice restaurants. Luckily there was a budget hotel right on the main street. I ate that night at a brewpub on that street. When I hear that the next presidential election will be decided in the Philly suburbs, it gives me pause. These people were fine, but they do not strike me as obvious liberals. Their vote for Obama will not be automatic. This was a nice street, but it did not have the multicultural urban vibe of downtown Philly that I found the next day. Lots of people seemed to have on their pressed jeans for a night out. While not wealthy looking, there were no minorities. The next morning, I wanted to ride back to Philly by the Main Line, a route I had always heard about. However to get there I had to cut across a mostly empty looking section on the map towards Paoli, fifteen miles away. I found out the reason few roads went this way. These roads crossed two or three hills so large they could be called small mountains. This area was beautiful, but wealthy. Tiny twisting roads crept around the landscape, sheltered by trees. Houses tended to mimic the mortar and stone look of rural Pennsylvania. Estate after estate were stuck up in the hollows of these hills. For about an hour, I am sure that over seventy percent of the cars I saw were German, mostly Mercedes and BMW. One not so big house had three BMW SUV’s in the driveway. Exhausted from over an hour in the hills, I pulled into Paoli. Things leveled out from here on in. The Main Line train stations read like a college guidebook: Paoli, Berwyn, Villanova, Bryn Mawr, Haverford, Ardmore. I passed several campuses, including the Villanova campus, which is lovely. Lancaster Pike crosses the Philadelphia city limits just east of the town of Wynnewood, two train stops past Bryn Mawr. While even Google bicycle had routed me back to the bike path through the park, I was determined to take Lancaster Pike all the way in. It was a straight shot on a street with a bike path. Crossing into the city limits is like hitting a switch. I dont’ think I saw a single African American in any of the Main Line towns. In the blink of an eye, Lancaster Pike went from rich and white to poor and black. On this Sunday morning what is now Lancaster Avenue had very little traffic. I zoomed along, pulse racing. Is it racism that I fear riding through a lower income black neighborhood? No one gave me a hard time, and it all looked relatively normal. There were lots of stores on this major street. Off on some side streets, I could see the occasional burned out or abandoned building. I did pass (quickly) a parked group of motorcyclists on crotch rockets warming up on the side of the street. It must have been several miles and about a half hour before I rolled into the “safety” of the gentrifying area around Drexel University. I was back in the Center City area by noon, and I had some time to spin around neighborhoods both to the north and south of downtown. They all seemed vibrant in a relaxed way. It was all very multicultural and multiracial looking. While I am not really serious, I could be happy living here. Lunch was at an Irish bar downtown, five to ten minutes bike ride from the 30th Street Station and my afternoon train going south. It was a great and gentle vibe sitting there, in friendly and unpretentious surroundings, drinking beer and eating a mediocre version of a Philly cheesesteak. I read their local alternative weekly. The city of Philadelphia in the past decades has lost something like a quarter of its population, which amounts to something like a half a million people. The paper described a situation where the city has at least forty thousand empty lots or abandoned buildings. Forty thousand. These neighborhoods of abandonded buildings ring like an arch around Center City. Jobs in manufacturing were lost by the tens of thousands, maybe hundreds of thousands. Racial tensions caused white flight. Yet at least the downtown area now feels comfortable and relaxed, prosperous without being greedy or rushed. There were lots of tourists, but I also felt the presence of locals who seemed to know each other. I am reminded of what someone said about Montreal, after their French language laws caused many banks and major corporations to move to Toronto. “The assholes all left and the cool people stayed.” Sure, Philadelphia is hurting, but it also can be a very nice place, and its feels, in parts, like it is moving forward.